We'll e-mail you pricing, product brochures, and information on the StatIM cassette sterilizer line. StatIM operator's manual? Or df you have a question concerning service? Please call SciCan directly at 800-572-1211. The StatIM 2000 has a cassette with inside dims 7" x 15" x 1.5" high. The StatIM G4 Line also has these same cassette dimensions available. The StatIM 5000 has a cassette with inside dims 7" x 15" x 3" high. The StatIM 7000 has a cassette with inside dims 8.6" x 13.7" x 2.5" high. The Statim 5000 may also be equipped with a built-in printer.The Statim 2000 and 7000 and new G4 line come with a USB printer port. 2. It has pre-vac (and a dry cycle), making it ideal for anything lumened. 3. It is extremely delicate on your most expensive instruments and blades, extending their useful life. The brand new StatIM G4 line available! For expensive ophthalmological and dental instruments, for anything delicate or expensive, the Statim cassette sterilizer from SciCan is, without any question, the very best choice. The Statim runs one enclosed cassette at a time, with a fast pre-vacuum cycle to draw all of the air out of the cassette prior to the steam sterilization cycle, as well as a final drying cycle which removes fully 99% of all moisture from the instruments in the cassette. This ensures the very best and most thorough sterilization available on the market, and constitutes the only approved sterilization for lumened instruments (instruments with concavities or tubing that would otherwise not be penetrated by the steam in a conventional gravity sterilizer). The pre-vac, combined with the size of the cassette itself, allows for very fast sterilization as well — in and out, dirty to clean and dry — in under 9 minutes. This in large part accounts for why the Statim is so gentle on your expensive surgical instruments. Shorter exposures, less time sitting in steam and wet, means less wear and tear. Another advantage of a single-cassette sterilizer like the Statim 2000 or Statim 5000 is that your instruments can remain inside the closed cassette, even after you pull it out of the machine, sterile and safe, as they are brought into the operating room and opened only when you are ready to begin using them! Imagine what it might do for your work flow, the case load you would be able to efficiently move through every day, if you had two cassettes, trading one set of instruments in one cassette for freshly sterilized instruments in the other cassette, rotating your instruments through every six to nine minutes! Would that enable you to see more cases than you are now? 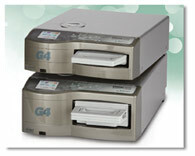 Would it cut down on time your staff is spending now, every day, waiting for the regular sterilizer to finish its cycles?